How can an author squeeze sweetness from such bitter facts: A mother must give up her son upon his birth. Forced to work in the cornfields 12 miles away, she gets to see her boy only a few times before she dies. 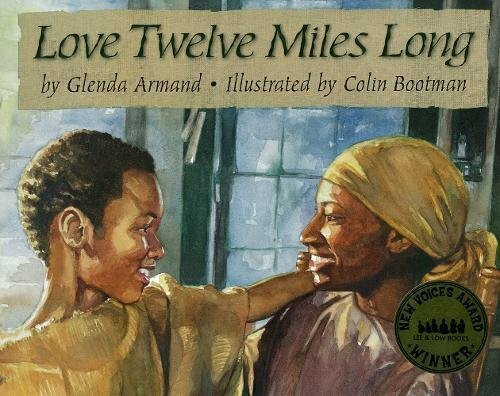 In her moving debut book, Glenda Armand takes us back to 1820s Talbot County, Maryland, to imagine how precious those few visits could have been for the two. Wrapped in her shawl, Mama arrives late at night, bringing Frederick her full heart and a slice of ginger cake. Mr. Bootman strews soft candlelight in his lush watercolor painting of the reunited mother and son sharing smiles no one can buy or sell. Of course, the boy longs to spend more time with his mother, but she tells him it’s too far for him to walk. How, then, does she do it? “The way I walk makes the journey shorter,” she says. In a story brimming with hope and love, the real-life horrors of slavery lie elsewhere, where an older audience can grapple with them. The author’s note gives additional information about Frederick Douglass, who changed his surname in order to obscure his identity from the master he escaped. Douglass wrote that his mother, Harriet Bailey, taught him a powerful lesson: that he was not “only a child but somebody’s child.” How remarkable that she accomplished this under such constrained circumstances. But let us leave the mother with her miles to go before she sleeps. We can all use a comforting story of love, even—or especially—if it is ripped from a brutal past. Janice Floyd Durante’s varied career includes copyediting for Wilmington News Journal, college and grade school educator in English and American literature and writing, and librarian. Her book reviews, travel articles, essays, and interviews have appeared in a number of newspapers and magazines. Her poetry has been published in Dickinson Review and Boulevard.